Anadolu Ponies, also called Transbaikal Ponies, Native Turkish Ponies or just Turks, are the most common Turkish horse breed. They are known for their speed, endurance, and robust nature. Anadolu ponies draw on the blood of several ancient breeds, including the Arabian and Akhal-Teke, although Anadolu bloodlines are ancient in their own right. 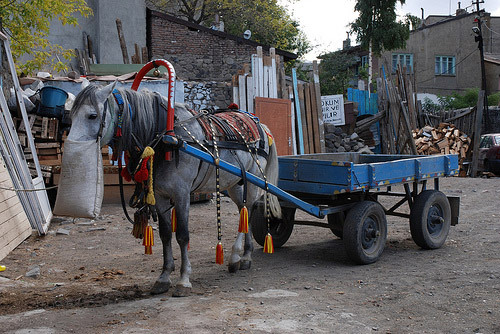 The Turkish people have always had a need for this versatile native pony in farm work, as pack animals, and for transportation. They require little care, making them easy to own almost anywhere in the country. They have an average height of 12.1 – 13.3 hands and are a small horse with great strength and endurance. Their head is small and can be refined – both convex and concave profiles, the ears are long and set low. Their neck is short and thick, their withers are low, and they have a narrow chest. Their legs are strong with good bone, and their feet are hard. They are found in most common colors .They can survive in poor conditions and do well as a pack horse or riding horse.